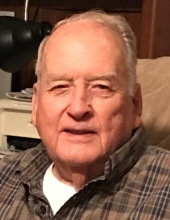 Joseph E. Bowery, 88, of Crooked Creek, went home to be with his Heavenly Father on Saturday, February 2, 2019 at CAMC Memorial Hospital in Charleston surrounded by his loving family. Born July 1, 1930 in Logan, WV, he was the son of the late Ulysses G. and Pearl Lively Bowery. He was also preceded in death by his Aunt Cora Chandler. Joe was a U.S. Army Veteran at the end of WW II (The Big Red One) and served in the National Guard for a total of 22 Years. Joe was a longtime member of the Central United Baptist Church, and was known as a fun loving and caring member and Brother to all the congregation, who loved and adored him. Joe was a driver for Betsy Ross Bakeries, Valley Bell Dairy, UPS, and Amherst Coal. Those left to cherish the memory of Joe include his wife of 65 years, Ruth Fortner Bowery, one daughter, Kimberly Anne Bowery Carlton of Charleston and one son, Joseph (Connie) E. Bowery II of South Charleston, 4 Grandchildren Joey Bowery, Matt Bowery, Sarah(Jarred) Newhouse and John Carlton, 2 Great Grandchildren Brianna Bowery and Jaxson Newhouse. Joe was known as "The Cat" to many nephews, nieces, family, and friends who loved him dearly. He will be missed by all. A special thank you to Joey Fortner Bias and Mark "Gertrude" Bias and Bill Wooten for the special attention you gave to our Dad and continue to give to our Mom. Funeral Services will be held on Friday, February 8, 2019 at 11:00 AM at Central United Baptist Church in Logan, with Rev. Randy Skeens officiating. Burial will follow in the Donel C. Kinnard Memorial State Veterans Cemetery at Institute. Military graveside rites will be conducted at the cemetery. Friends may call on the family on Thursday at the church from 6:00 – 8:00 PM and also one hour prior to services. In lieu of flowers the family request that donations be made to the Bill and Ramona Wooten Scholarship Fund, C/O Central United Baptist Church P. O. Box 1558 Logan, WV 2501. For email condolences go to:www.honakerfuneralhome.org. Honaker Funeral Home of Logan has been entrusted with the arrangements. To send flowers or a remembrance gift to the family of Joe Edward Bowery, please visit our Tribute Store. "Email Address" would like to share the life celebration of Joe Edward Bowery. Click on the "link" to go to share a favorite memory or leave a condolence message for the family.